Today’s finance organizations are always seeking for ways to increase the efficiency and timelines of their financial close and compliance processes. And this is where we added a lot of new functionality in this release. Let’s look deeper into it. Advanced Financial Closing allows you to plan, execute, monitor, and even analyze financial closing tasks for the entities of your group. Five easy-to-use apps with a uniform look and feel have been specifically designed to support periodically recurring closing activities. This can be done in a fixed chronological or dependent sequence and allows for multiple stakeholders. To increase the automation degree of your closing process, you can define task templates and benefit from task template sets with standard closing steps. For maximum transparency, Advanced Financial Closing lets you monitor the progress and completion status of all your closing activities. Now with 1902 very important functionalities have been added: the group structure manager and the matrix consolidation. The group structure manager enables customers to maintain information for acquisition and divestiture, such as the consolidation method, the period of first & last consolidation, and mapping between the consolidation group and consolidation unit. This information along with the ownership triggers the process of consolidation of investment. 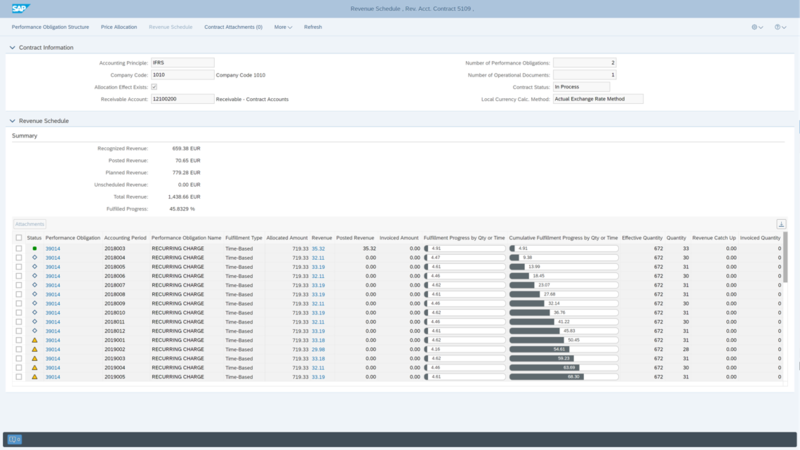 Another new functionality that enhances group consolidation covers managerial consolidation and matrix consolidation. This allows customers to run matrix analyses comprising hierarchies of different dimensions in the same report, for example consolidation units in a regional hierarchy in one axis and a profit centers in a line of business hierarchy in the other axis. We enabled time-based revenue recognition according to the IFRS15 standard covering multi-element arrangements of provider contracts in contract accounting and invoicing. It provides highly automated revenue recognition for large numbers of contract items and billing plans along the 5-step-model. And the revenue recognition process is fully integrated with G/L. 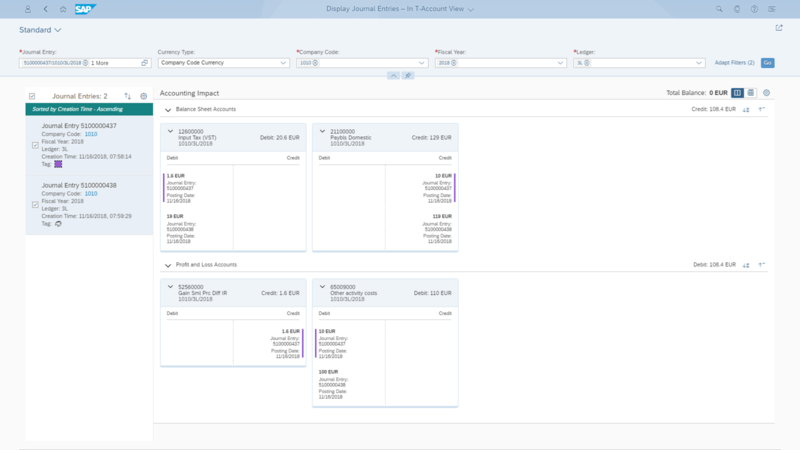 On the Fiori Launch pad, there is new a group which contains all apps belonging to purchase order accruals. The first one Schedule Accruals Jobs and contains now all jobs which are necessary for purchase order accruals, such as starting proposal and posting run. 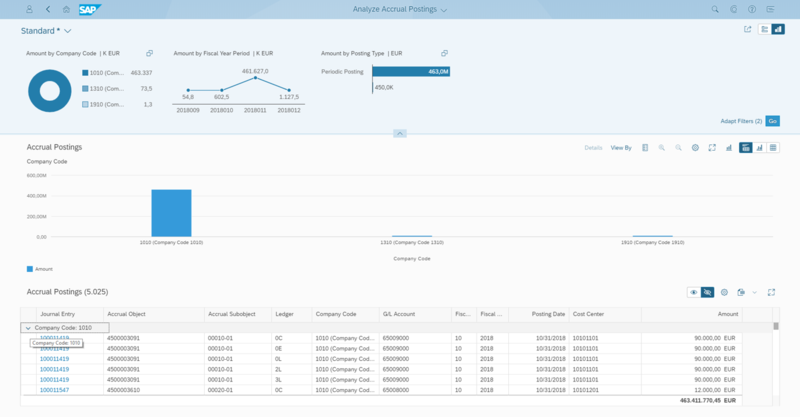 The new Analyze Accrual Postings app is an analytical overview page which provides transparency regarding all accrual postings. As purchase order accruals are current liabilities for which will have to pay at some point soon, it is vital for a company to keep an eye on the amounts there. 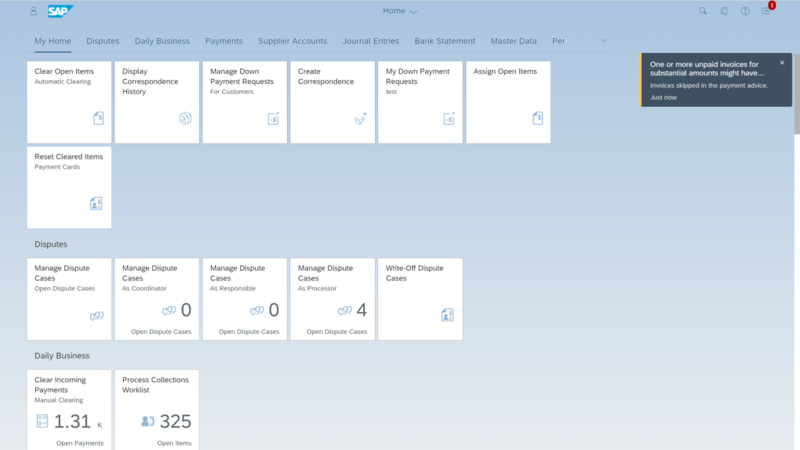 The new SAP Fiori App ‘Display Journal Entries in T-Account View’ allows you to display your journal entries in T-accounts. The line items are displayed as debit and credit postings in different accounts. Accountants are very much accustomed to this way of looking at postings and it helps them find errors quickly or understand complex postings better. You can either call up the app directly or indirectly as a document flow application. You can even display multiple journal entries at once and highlight the entries with different colors. Situation handling brings urgent issues to the attention of specific groups of users who are then able to react immediately to the notifications they receive. This not only speeds up the handling of specific situations in your company, but also supports the optimization of your business processes. 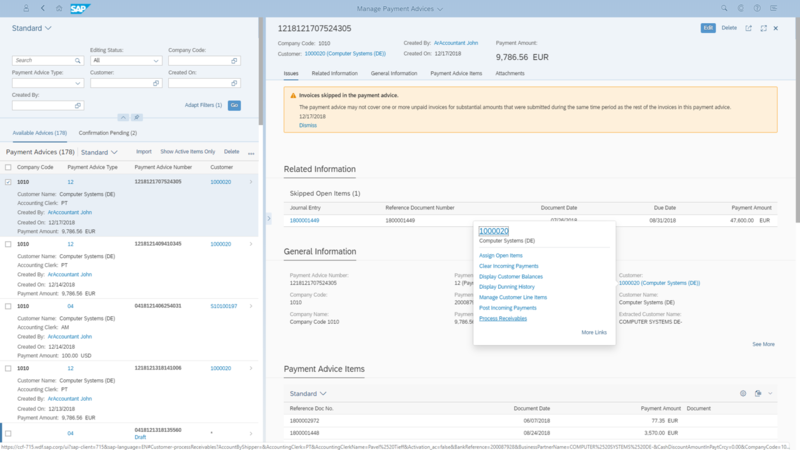 The new situation for ‘Invoice Skipped on Payment Advice’ maps the invoice numbers mentioned on a payment advice to the corresponding open items on the customer’s account in receivables. Looking at the due dates of the respective journal entries, it derives the date range covered by the payment. In case another document or documents exist within the same data range, not included on the advice, a situation is created, and defined users are automatically notified. From there they can immediately follow up with embedded smart links and create a customer correspondence / dispute. With the integration of the SAP Enable Now product you can customize and enrich the Web Assistant – the context sensitive in-app end-user documentation. The integration allows you to customize any SAP in-app standard content and to create your own guided tours and context help for specific application functions. In addition, a what’s new mode can inform the user about the latest changes within the product pro-actively. Furthermore, any SAP Enable output – such as interactive simulations, courses, documentation, or videos – can be easily embedded into the Web Assistant.